... and it's starting to feel a lot like Christmas! The past week has been very busy with all things festive - the school production, 2 Christmas functions, and this week is just as busy ... helping with annual candrive for Foodbank, end of year school things, and work fitted in there as well. But the end is in sight ... with just 12 days to go before I can enjoy 2 weeks of sunshine and fun with the family on our annual summer holiday. I have my camp chair and my jandals ready, a growing pile of novels and new magazines and a few beverages stocked up ... aahhhh bliss! 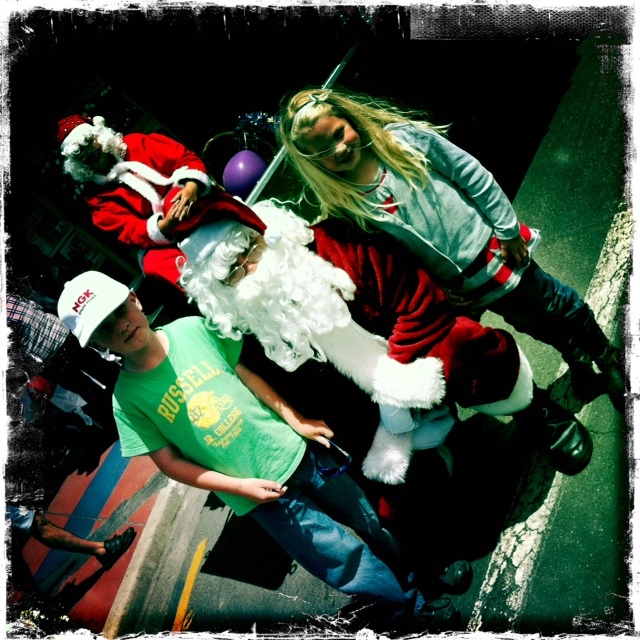 Took this snap just after the kids posted their letters to Santa at the post office. Emma piped up afterwards ... 'We should have just keep our letters and given them to Santa then, now he won't get them til tomorrow in his mailbox!' - ahhh so cute! Hope you all get to spend some time with family and friends to enjoy the true spirit of Christmas.